I’ve just finished re-watching The Godfather, part I and II. The last time I watched them was before I’d become a Christian (I’ve got the first film on VHS – lol!). This time round, I saw some interesting themes in the films that I wouldn’t have picked up before I was religiously aware. ‘Godfather’ is obviously a religious term. 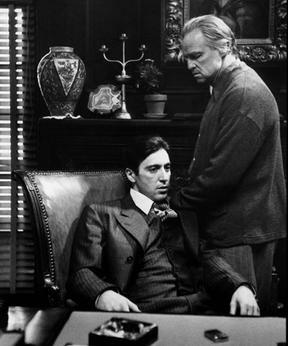 In the first film, becoming a Godfather and the act of baptism is seen as a very important thing, especially to the Corleone family. Godchildren are looked after. They become part of the family. Being part of the family is sacred, vital. It becomes what the Bible calls an ‘idol’ – something that’s made more important than God. So in some senses, the act of baptism (into the family) is actually more important than God in the film: it’s lost the original meaning of the ritual. However I see the main theme in both movies to be that ‘love’ for your family can lead to evil. Vito Corleone’s concern for his family – which is profound and touching (“a man who doesn’t spend time with his family can never be a real man”) – is actually what leads him into organised crime. He wants to provide for his family and protect them. Yet you see that the deeper you’re in, the more violence you’ve got to enact in order to keep control and keep on top – and the more at risk your family becomes from the violence. Why do they want to be in the mafia? For Vito, and initially for Michael, it seems to be because they want to protect the family. Michael initially rejects the Mafia, but gets involved after the attempted assassination of his father. Yet, their families are decimated by the violence of their profession – they see their sons and brothers killed, one by one. So is a lesson from the film, that attempting to protect people or do good through evil, will not ultimately protect them or do good? Another aspect of this theme is revenge. Vito wants to avenge deaths of his mother and father, and ultimately does so. Michael wants to avenge his father’s assassination attempt, and does so brutally. Ultimately this desire for vengeance takes over, and trumps the love for family, in Michael’s life. His wife is banished for aborting his child, and his brother is killed for betrayal. The end of the second film sees him all alone – betrayed, and deserted. Forgiveness is intrinsic to Christianity, it’s essential and for a Christian, it must be stronger than family love. I think this is the message of The Godfather films. Without it, vengeance and hatred will ultimately ruin your family. Evil cannot conquer, using it cannot protect the love you have. Only love and forgiveness can. Hence the powerful baptism scene in the first film, where Michael’s profession of faith, where he claims to believe in Christ and to renounce the works of the devil, are contrasted with his brutal acts of revenge following his father’s death. The motive for the killings is to protect and avenge his family – yet he agrees to be godfather to his nephew. The brutality of his vengeance is for the motive of family – but is clearly the opposite of the faith he is professing, as the director makes clear. These contradictions make for the compelling storyline, but there’s a lot to learn from it too. I think it’s saying, that you cannot love, and you cannot love your family, without forgiveness in your heart, for all people. If you treat your family as a god – as an idol – it will collapse, and be destroyed.